Subscribe now and don't miss a single issue! Get your copy delivered to your castle door by First-Class Mail. Your 3-issue or 5-issue (1 year) subscription will start with Scary Monsters 113th Women of the Silver Scream Issue coming in June 2019. We're in our 28th year! Subscribe to the only Real Monster Magazine highlighting the classic horror and sci-fi films of the 1920s through the 1970s! Why risk a sell-out at the newsstand? All new or renewed subscriptions now start with Scary Monsters #113. 3-issue subscriptions cost $40 ($10 per copy + $5 postage + $5 convenience fee for credit card purchases -- U.S. mail orders using check or money order do not pay this fee, see below) and include Scary Monsters #113 (June), Scary Monsters #114 (Sept), and Scary Monsters #115 (Nov). 5-issue subs (1 year) cost $60 ($10 per copy + $5 postage + $5 cc fee) and include Scary Monsters #113-117 (Summer/June, Fall/Sept, Winter/Nov, Monster Memories Ed/Feb, Spring/April). Indicate your choice of subscription at the drop-down menu above. Bagged and Boarded Option: Subscriptions including "bagged and boarded" service (additional $1 per issue), and Canada subscriptions, are available by making selections at the drop-down menu above. Existing subscribers whose subscription ended with Scary Monsters #112, or an earlier issue, can indicate their wish to renew their subscription at the drop-down menu. Each U.S. subscription includes shipping by First-Class Mail in a manila envelope. Canada orders ship First-Class International in a cardboard mailer. Regarding Shipping Insurance: It is NOT available for subscription mailings, therefore DO NOT select insurance in the shopping cart. If you require insurance, please purchase your copies individually rather than through a subscription. Individually ordered copies are shipped in a bend-resistant cardboard mailer. Missed a back issue of Scary Monsters? No problem! 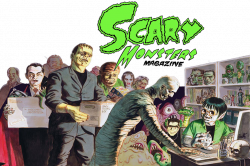 Pick up the copy you missed here in our Scary Monsters and Monster Memories Back Issue section (to the left) or just type in the issue number you are missing in the search bar to find it quickly! For U.S. Orders Only: Pay by money order or check and subtract $5 off your online subscription order total (your receipt won't take the deduction automatically). In the shopping cart select the "Mailed Payment" option. Payments must be made out to MyMovieMonsters.com, PO Box 567, Wildomar, CA 92595-0567.